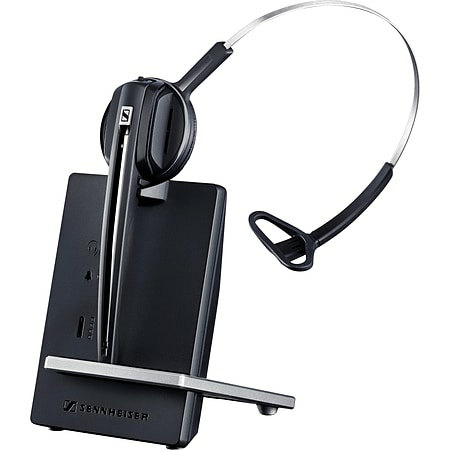 Sennheiser D 10 USB ML is a streamlined single-sided wireless DECT headset connecting directly to the softphone/PC to provide uncompromising sound for office professionals using Skype for Business. Sennheiser Voice Clarity and noise-cancelling microphone optimize speech intelligibility. Designed for all-day use, D 10 USB ML is a lightweight headset with 2-in-1 wearing style (ear hook and headband). Features include phone conferencing, hot desking and Sennheiser ActiveGard® hearing protection against acoustic shock. Sennheiser D 10 USB ML is a streamlined single-sided wireless DECT headset for office professionals using Skype for Business requiring uncompromising Sennheiser Voice Clarity, all-day wearing comfort and excellent sound around the office. Sennheiser's innovative and patented hearing protection technology against acoustic shock. Experience quality sound on the move as you roam around the office. Wireless freedom extends your working range so you're always within reach. Typical office building: up to 55 m. Line of sight: up to 180 m.
For the best possible communication between caller and listener, Sennheiser Voice Clarity uniquely enhances the most important frequencies and details of the human voice. For the caller, sound is crisper and clearer, allowing them to hear the nuances contained in spoken conversation - and for the listener, a noise-canceling microphone sends the clearest signal to improve intelligibility. In combination this results in better, more natural sounding conversations where no important details are lost.